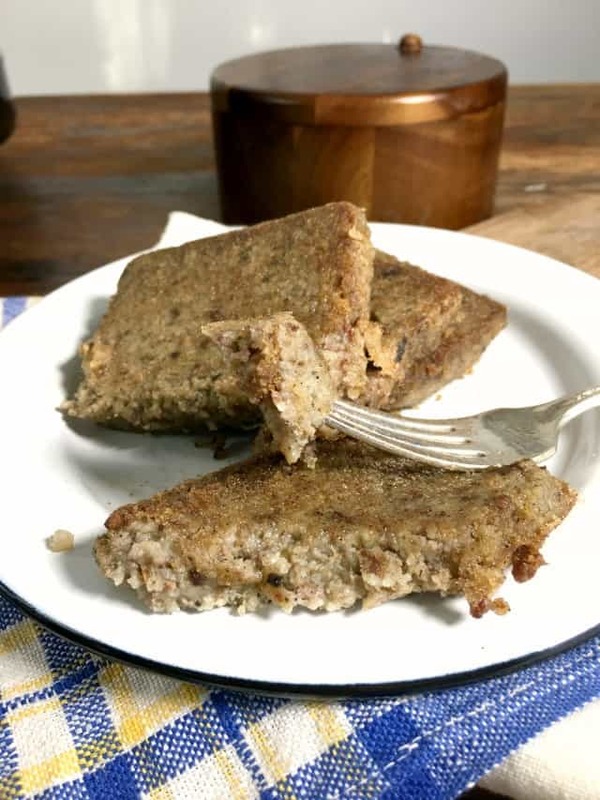 Delicious crunchy on the outside, soft on the inside, flavorful, spiced scrapple is the best breakfast EVER! 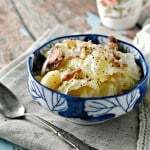 Served with eggs, waffles or pancakes makes the perfect breakfast or even breakfast for supper dish! First, though, you have to know how to cook scrapple! 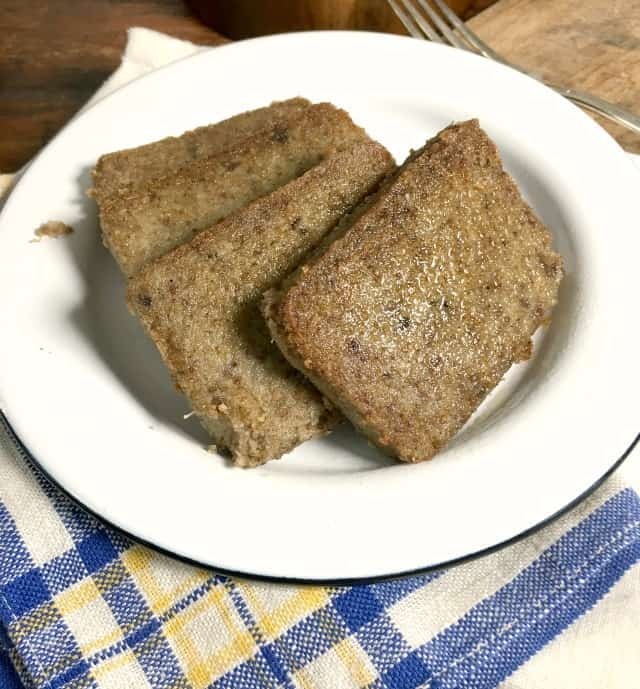 Scrapple is a favorite Pennsylvania Dutch dish that has now traveled south! 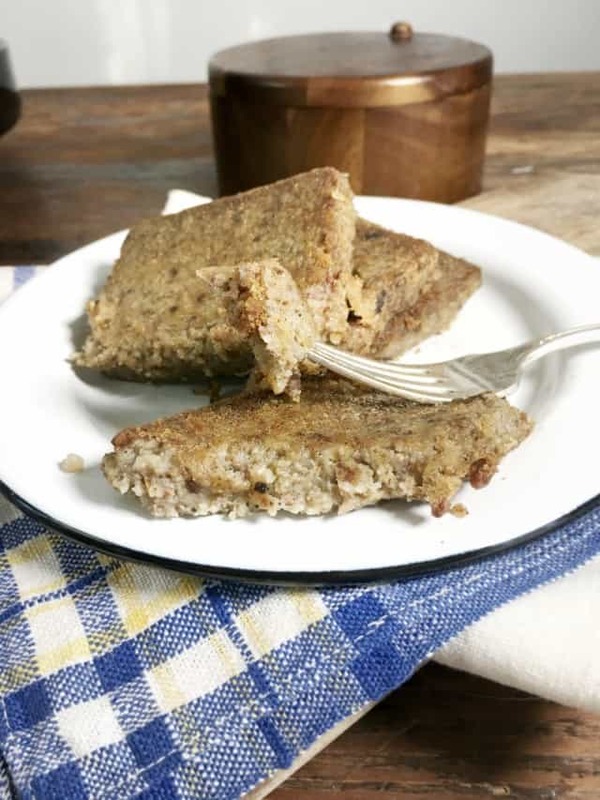 Scrapple is affordable and delicious and a perfect substitute for breakfast sausage! 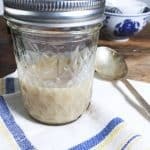 Makes use of bacon grease to add more flavor! Shows you how to put a crispy edge on a delicious piece of meat! According to my friend Wikipedia, Scrapple is made from pork meat that is cooked and then mixed with cornmeal and spices and formed into a loaf. 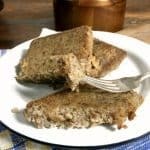 Scrapple comes in a loaf or block form. Slices are cut from the block, dredged in a type of seasoned flour and then fried till crispy on the outside. Scrapple CAN be baked (but I recommend pan frying per the directions below). 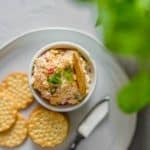 All you really need to do is slice off a ½ inch thick slice, place it on a prepared baking sheet and bake at 375 for 20 minutes on one side and another 20 on the other side. Once cooked, like sausage, you will want to consume your scrapple within an hour or two. Refrigerate unused scrapple and it will be good for about 5 days in the refrigerator. Check the expiration date on the package of scrapple to understand when the package expires. 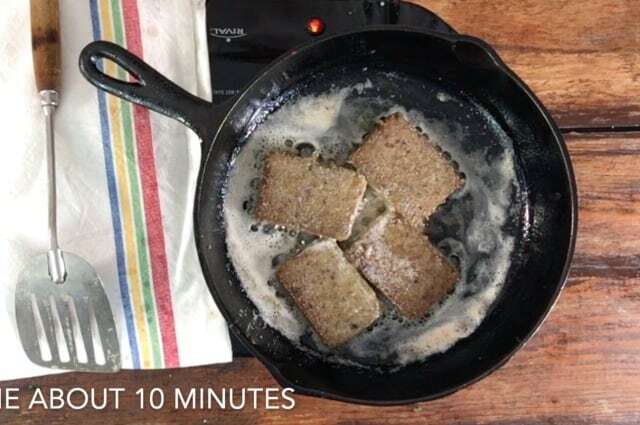 You can freeze scrapple once it has been cooked. 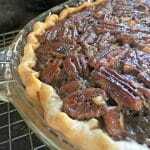 Place it in a freezer safe container label it, remove as much air as possible and place in the freezer. It will be good for 3-6 months. Unused raw scrapple can also be frozen. Follow the same instructions as above and It will be good for 6 months to a year. 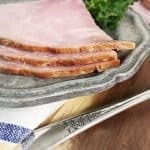 WHAT CAN I SERVE WITH MY SCRAPPLE? 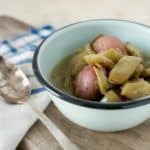 Lots of great dishes work with scrapple! 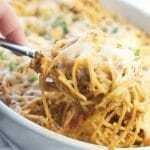 Sweet potato hash brown breakfast bake! LET’S SEE HOW THIS IS DONE (There’s a short video in the recipe card below if you want to see Wendi cook scrapple). Fry in a small amount of oil and butter for 3-5 minutes per side. 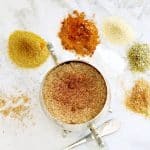 This recipe shows you how to get a nice crispy crust on your scrapple and how to make a seasoned breading. 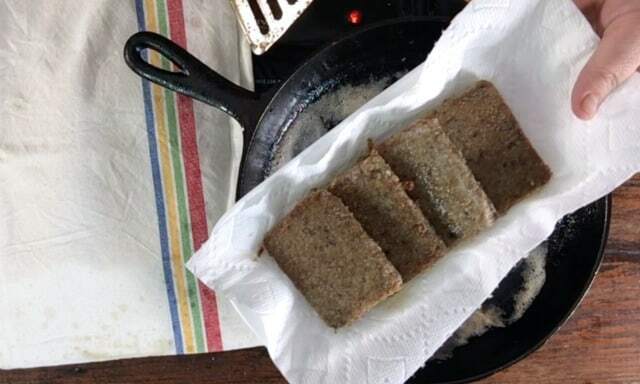 Cut 4 ¼ inch slices of the scrapple and lay on a clean paper towel (this helps remove moisture). In a large bowl, mix the Wondra flour, garlic powder, onion powder, cayenne, salt and pepper and mix well, set aside. In a 10” cast iron skillet, heat the bacon grease and butter until hot and a drop of water spatters enthusiastically. While the pan is heating, very carefully dredge the scrapple slices in the wondra flour. 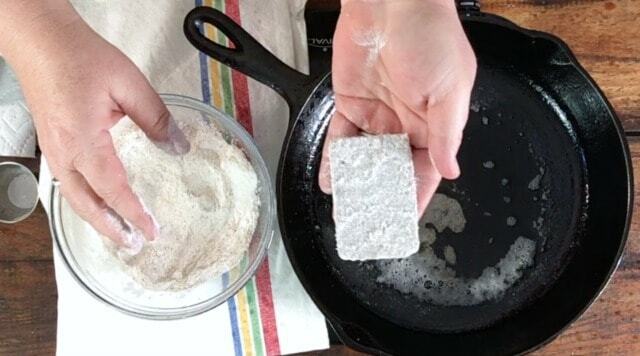 Pat the flour into the scrapple gently. 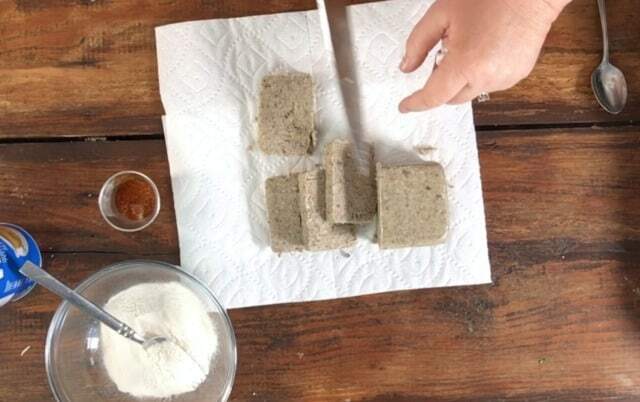 Lay each piece of scrapple into the hot oil after it is dredged in the flour. Fry as many as 3-4 at a time. Cook for 3 minutes per side without disturbing during cooking, turn the pieces very gently. Remove to a clean paper towel to drain. 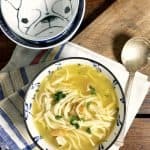 It is ok to leave the cayenne pepper off is you do not like a little hot flavor in your food. Make sure to use the kosher salt and not table salt. If using table salt, reduce to “just a pinch” The wondra flour makes a nice crispy exterior, if you use regular flour, it is ok, the edges just might not be as crusty. What shopping markets does one find scrapple? Hi Candace! I don’t know where you live but I’m in NC and I bought mine at Food Lion right beside the sausage. 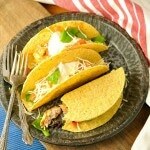 You make it look pretty easy and tasty! I’ll give it a try!